It’s been a while since I had my last coffee. And by a while, I mean almost six years. Six long, dry years. Sure, I’ve had the occasional sip – a mixed up order where the C for chai was translated as a C for cappucino, but nothing substantial, and certainly nothing intentional. The upside of it all comes in the form of better sleeping patterns, fewer stomach problems and headaches that don’t immobilize me like the used to… but the downside. Oh! The Downside! Remember the days when the only viable option for a weight conscious, coffee-avoiding, dairy intolerant girl around coffee time was a bag of ground up vegetation dumped unceremoniously into a cup of hot water for $3.50? Well, that, or a soy babycino? Worse still was the problem of finding an instant coffee substitute. Yes, tea in a bag was adept at warming the hands and providing a person with something to sip on, but I drink mine black-no-sugar, and it lacks a certain fragrant warmth that only coffee has. Milo, ovaltine and horlicks were in short supply, and made me feel like bedtime. It seemed all would be lost when I found chai. Now I’ll be honest and say that I wasn’t enamoured at first sip. It was too sweet. Too spicy. Too gritty. Too insipid. And oh, too hard to prepare in an office kitchenette. Turns out all chais are not created equal (the one from the cafe across the street is certainly created better than most), and that there is one on the market that makes a decent mug. I wouldn’t have it every day but it’s certainly a decent beverage for a brisk morning’s start. The family, on the other hand, won’t have it at all. 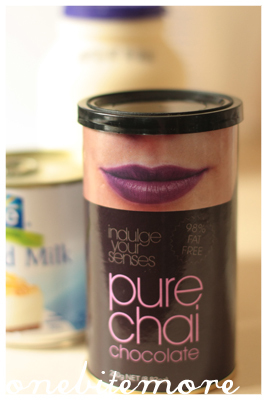 And, with two tins of the chai in my possession (courtesy Rachel of Polarity Consultants) I needed to do something with it. This ice-cream is perfect for the non-icecream-maker-owning persons of the world, such as myself. And, best of all, it only has three ingredients! Count ’em! One, two three. That’s it. The cream holds the airy bubbles in place so you won’t need to pull it out of the freezer to whip it every two hours, and the condensed milk gives it a lovely slippery texture. And the family? Well they didn’t like the chai I fed them as a beverage, but they’ve certainly made huge dents in my ice-cream! 1. 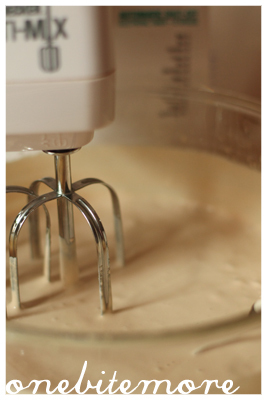 Tip all of your ingredients into the bowl of a stand mixer and beat for about five minutes. You’ll know its done when the mixture has almost doubled in volume and you can see a trail when you flick a spoonful of the mixture onto its surface. 2. Pour the mixture into an airtight container and put it in your freezer overnight, or for at least four hours. If you like, you can pull it out after a couple of hours and stir it so that it freezes evenly. Or not, it works almost as well. 3. Stick a spoon in and eat it. Or you could do what I did and chop up some tim tams to line your glass with. Yummo! oooh if only you wrote this post before I bought my ice cream machine haha. Ahh the magic of sweetened condensed milk never ceases to amaze me! That’s so great you don’t have to keep taking it out to churn it, that’s the main reason I can never be bothered making it without an ice cream machine. I’m so gonna try this method sometime, thanks! 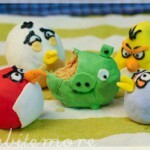 This looks so yum! 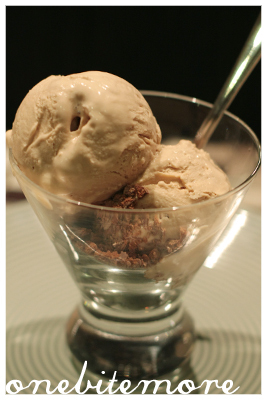 I love ice cream but it’s hard finding a recipe that doesn’t use an ice cream maker. Thanks for posting! This is genius! I’ve never attempted ice-cream before, but I reckon I could give this a go! Snap! 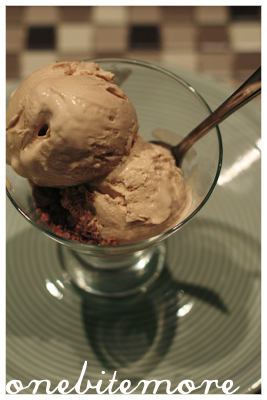 I made ice-cream too…but mine definitely had more than 3 ingredients…should have visited you first! That looks really creamy. No machine? I wouldn’t have even thought about trying to make ice-cream without one. 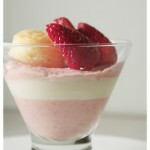 This looks so deliciously creamy! 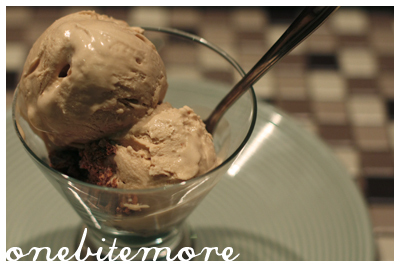 Hooray for Ice Cream!This is for us with no ice cream maker :)This sounds great! I cant wait to try it!I’d love to guide our readers to your site if you won’t mind.Just add your choice of foodista widget to this post and it’s all set, Thanks! 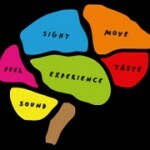 @Steph: Looking forward to seeing how you go, I love the flavours you come up with! @Zina: Glad to have been of assistance! @Yas: Me neither! Well, not successfully! 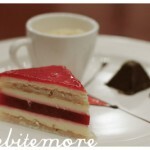 @Julia: It has that slightly tacky mouthfeel that comes with condensed milk, but otherwise, it’s a great alternative. @FFichiban: Steal away! Or, rather, borrow and link back? @Fiona: Me too… I’m getting fairly sick of watery hot chocolates.